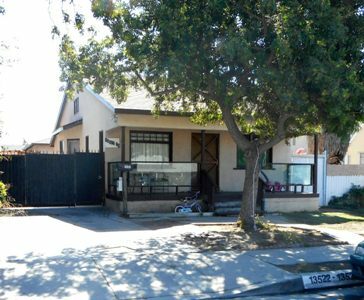 DESCRIPTION: TRADITIONAL GATED DUPLEX IN THE VERY DESIRABLE CITY OF GARDENA, CALIFORNIA. FRONT UNIT – 3 BEDROOMS, 1½ BATHS. LIVING ROOM, DINING AREA AND KITCHEN WITH SERVICE AREA. DEN. DRIVEWAY. REAR UNIT – 2 BEDROOM, 1 BATH. LIVING ROOM. GARAGE WITH WASHER HOOKUP. REAR ALLEY SEPARATE GAS & ELECTRIC METERS FOR EACH UNIT. CITY OF GARDENA PRESALE INSPECTION REPORT AVAILABLE UPON REQUEST. PERSONAL PROPERTY NOT INCLUDED IN SALE. DO NOT DISTURB OCCUPANTS. GREAT FIXER OPPORTUNITY. CLOSE TO SHOPPING & 110 FREEWAY. FRONT HOUSE $1,100. PER MONTH. MONTH TO MONTH. REAR HOUSE $ 925. PER MONTH. MONTH TO MONTH. LOT SIZE: 6,700± SQ. FT. TERMS: CASH. BUYER TO OBTAIN OWN FINANCING. FINANCING IS NOT A CONTINGENCY TO THIS SALE. PROPERTY SOLD IN “AS IS” CONDITION WITH NO CONTINGENCIES WHATSOEVER. PROPERTY SOLD SUBJECT TO ACCEPTANCE OR REJECTION BY THE TRUSTEE AND SUBJECT TO COURT CONFIRMATION.